The Creative Assembly have been busy. Not only have they produced a patch that addresses a few lingering niggles with the performance of Rome 2, they’ve also bolstered it with a whole new faction and added support for the Steam Workshop. It’s all here in one big download, which should be already dribbling down your copper cables right now if you own the game and have Steam open. 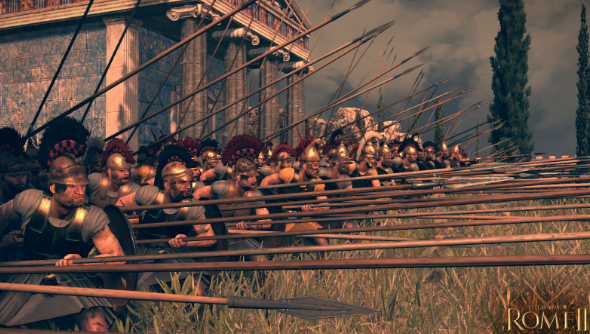 The free new faction comes in the form of The Seleucid Empire, who are now playable in the campaign and multiplayer. A cavalry-dependant people, the Seleucids come with unique units and their own building and tech trees, as well as new campaign objectives and new wonder the Paradise of Daphne. The patch side of the download brings the fifth set of fixes to the game, and aims to improve performance in every element. The campaign map has had a lot of tweaking performed upon it, with improved framerates achieved, despite numerous armies and fog-of-war being on screen. You’ll also be pleased to hear those lengthy end-turn times have been sped up. Faction AI has been sharpened up, which leads to a muchly improved diplomacy game. Now the AI will look to form alligences based on personality, selecting friends and enemies depending on threat level and their existing relationships. The patch notes are lengthy (six scroll wheel turns by my count) and no doubt a pleasing read for dedicated Rome 2 generals. Take a full look at them at the Total War Wiki. Finally in this week’s Rome extravaganza, we get Steam Workshop support. You all know what this means: absolute modding heaven for both players and creators alike. There are already a handful of entries on the Rome 2 Workshop. I give it a week before it’s in triple figures.